Yayyy, finally is Friday, it seems this week has given me for wearing colored pants, this time wearing again my turquoise pants to recreate Jessica Alba's look of a few months ago, she wore it on April, i decided to wear it now to take advange of the weather, it was a little cloudy and rainy, why this day? Because i wanted to wear the hole look and the scarve, hope you liked all my recreations, have a wonderful and fashionable weekend, im so exciting because next Friday is my birthday, muahhh. Heyyyy es Viernes finalmente, al parecer esta semana me ha dado por usar pantalones de colores, nueva vez vuelvo a usar mis pantalones turquesas, esta vez para recrear un look de hace unos meses de Jessica Alba, ella vistió este look a principios de Abril, yo aproveche que este día estaba nublado y estaba lloviendo por ratos, para poder recrear este look, ya que, quería también hacerlo con la bufanda, espero que les gusten mis recreaciones, buen fin de semana mis amores, estoy bien emocionada, el viernes próximo es mi cumpleaños, muahhh. Unkown Scarf(bought in a local store)/ Bufanda desconocida de aquí. Beautiful outfit, especially tha blazer. What about following each other? Love the pink blazer & really love the color of your pants! Love how you styled it, the color combo is lovely..you look great! Love this outfit! I the colours you chose are actually better than Jessica Alba's! I am following you now! And if you like, check out my blog and maybe we can follow each other? 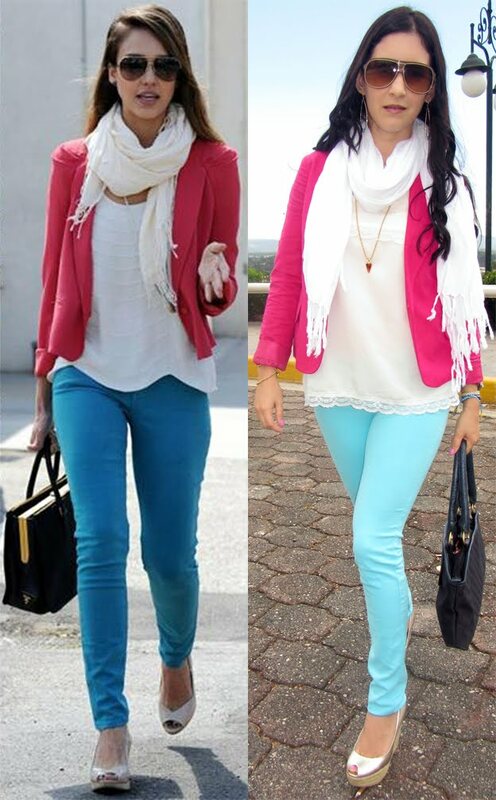 El look te quedo a la perfeccion Anyelina!